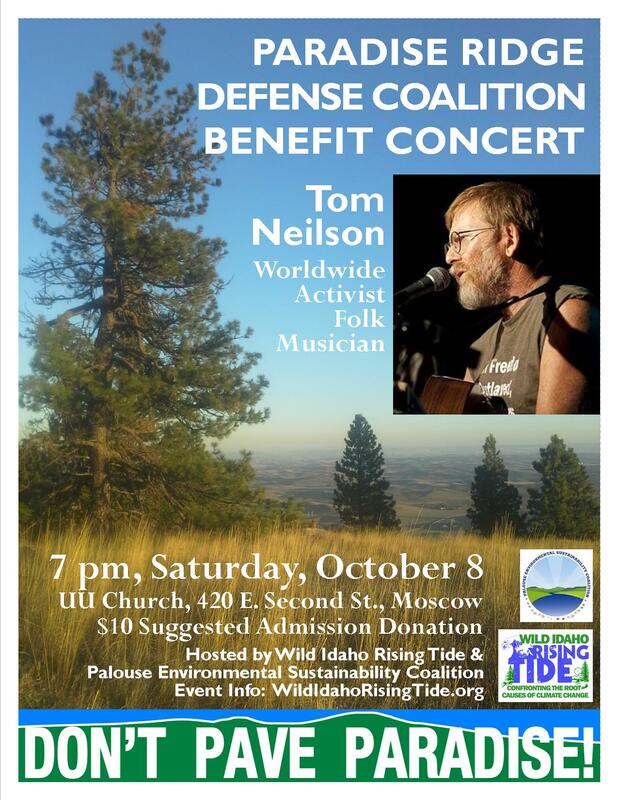 Please print and post the linked, color, letter-sized, PDF version of the Tom Neilson Moscow Concert Flyer (tom-neilson-moscow-concert-flyer), invite your friends and family through the email messages and website and facebook links about this event, participate in this Paradise Ridge Defense Coalition Benefit Concert, and enjoy the rousing music of Tom Neilson! Tom Neilson has performed his powerful, change-effecting, folk music with his voice and guitar in 21 countries on five continents . His first professional work as a musician entailed singing at a funeral home in Lewiston, Idaho. He has since earned numerous recognitions, winning several folk festivals and the 2012 and 2016 Independent Music Awards People’s Choice for song of the year for social action. A celebrated veteran of both musical stages and street theater, Tom writes compassionate, humorous songs about historical and current events, intertwining his worldwide travel experiences with his upstate New York dairy farm roots and his fervent commitment to social and environmental justice. A 1960s anti-Vietnam war organizer, Tom has lived and worked in Colombia, Eritrea, Kenya, Nicaragua, Portugal, Senegal, and Somalia, and has been detained or arrested as a spy in Colombia, Morocco, Sudan, and at the U.S. border to Canada. He studied education and voice as an undergraduate at the State University of New York at Cortland, earned a M.Ed. in counseling psychology from Northeastern University in Boston, and wrote an international education doctoral dissertation at the University of Massachusetts Amherst, examining U.S. political/economic hegemony in the Horn of Africa and around the world. Tom has worked for the United Nations High Commission for Refugees and as a Peace Corps training director, rural development consultant, interpreter, coach, and carpenter’s assistant. He has taught musical theater, songwriting, English, and physical education, and worked with people with addictions, disabilities, HIV, and other public health issues. Combining art with activism at countless benefit concerts, this Jon Stewart of folk music has helped frontline communities organizing against fracking, toxic waste, water privatization, mountain top removal, nuclear energy, incinerators, GMOs, and globalization. Tom’s witty, sophisticated, and political astute lyrics tell the stories of struggles for human rights against greed and violence. Known locally in his current home place of Greenfield, western Massachusetts, as the Bard Insurgent, Tom also enjoys backpacking in the Rockies with his partner Lynn and barnstorming with their son Jacob and ex-Red Sox pitcher Bill Lee. A prominent natural feature of the eastern Palouse region, Paradise Ridge harbors considerable forested land and a major portion of the remaining one percent of original Palouse Prairie historically significant to the Nez Perce and Palouse tribes of the area. Several ridge landowners have been working for decades to preserve and restore remnants of Palouse Prairie plant communities found there. The soil and plant life of the unique Palouse Prairie ecosystem evolved over eons; human efforts could never fully replace it, if lost. Many resident deer and moose, traveling herds of elk, wild turkeys, and a wide variety of birds and smaller mammals call the forest and prairie land of Paradise Ridge home. The ridge serves as an educational, cultural, scientific, and recreational resource for school groups and day campers at Paradise Ridge Challenge, for researchers and conservation groups who lead natural history field trips, and for individuals of the community who peacefully hike, explore, and enjoy the relatively pristine environment on Paradise Ridge. The Idaho Transportation Department (ITD) and the Federal Highway Administration (FHWA) propose building a new, four-lane route for U.S. Highway 95 high on the shoulder of Paradise Ridge, the E-2 alternative described in the draft and final environmental impact statements (EIS) for the U.S. 95 Thorncreek Road to Moscow Project . This unnecessary incursion would cut huge swaths through the sensitive environment of the ridge, as wide as two football fields in some places, clearing wildlife cover within 300 feet of the new highway to keep big game off the roadway. Weed infestation from huge road cuts would likely reach the top of Paradise Ridge, where the largest and highest quality remnant of original Palouse Prairie persists. But ITD analyzed two other possible, new routes for U.S. 95, labeled alternatives C-3 and W-4 in its EIS, which also meet all FHWA safety standards. For years, regional citizens have described the shortcomings and lack of benefits of the eastern E-2 route, as compared to the central C-3 route. 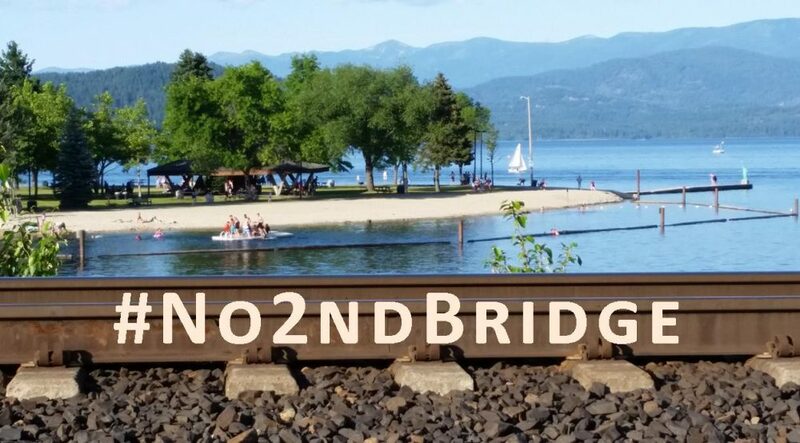 The Paradise Ridge Defense Coalition believes that ITD and FHWA could better accommodate the traveling public and conserve natural resources by implementing C-3. This non-controversial route, which ITD could have expeditiously chosen and constructed years ago, would straighten and expand the highway from two to four lanes by using more parts of the existing right-of-way. ITD documentation reveals the greater environmental impacts of the proposed E-2 route. Closer to native Palouse Prairie remnants and ongoing restoration activities than C-3, E-2 would destroy over three times as much wetland acreage, take twice as much prime farmland out of production, and excavate 36 percent more road cuts that provide disturbed ground for potential weed establishment. Wildlife moving across the E-2 corridor to access crucial, downhill, water sources would suffer higher rates of injury and death. Federal regulations specifically require that projects impacting wetlands must select the “least environmentally damaging, practicable alternative,” unless no other alternative is available. Designed to current specifications for new construction and similar levels of safety, both of the proposed C-3 and E-2 alignments would clearly be “practicable.” But the EIS states that, “The E-2 alternative would affect more wetlands that are functioning higher for habitat. The C-3 alternative would have the least effect to wetlands, in terms of acreage, function, and value.” Any realistic assessment of highway safety that considers the greater potential for increased weather- and animal-related accidents on higher E-2 through more big game habitat would conclude that C-3 is the safer route.